Home gutters is far from a fascinating subject and something most homeowners don’t think about, until a problem occurs. 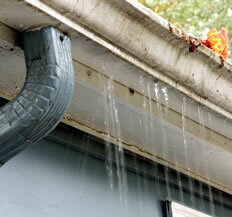 The gutters on your home serve an important role in protecting your home. It doesn’t take long for improperly working or clogged gutters to show wear and tear on your home, including causing leaks and water damage. Leaking Basements and Cracked Foundations: Clogged gutters are the number one cause of basement water problems. Roof water overflows and accumulates around the foundation. If this happens, basement leaks may happen, and the excess water against the foundation can potentially weaken the footings and lead to cracks. Rotted Wood: When gutters have debris piled up above the flashing or shingle line, the debris can hold moisture on the fascia board. The moisture can also affect the roof sheathing and framing beyond the fascia. The debris acts like a wick and brings water in the bottom of the gutter up to the fascia. Many homeowners have spent THOUSANDS of dollars replacing rotted wood that an inexpensive professional gutter cleaning could have prevented. Animals and Wood Destroying Insects: Lack of cleaning will also cause water to pond in areas dammed by debris. This condition is ideal for breeding mosquitoes. Plants, birds, insects and even mice will make a home in gutter debris. Sagging Driveways: Clogged gutters and downspouts can also cause driveway and walkways to sag and crack. Do not overlook the importance that clean gutters have on keeping your home water drainage system running smoothly and effectively. Water Damage can be costly, often thousands of dollars. Gutter Cleaning is Preventative Maintenance on one of your most valuable assets, your home. Copyrights © 2018 AA Window Cleaning | All rights reserved.